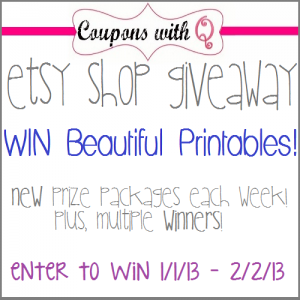 Welcome to our third week of the Coupons with Q Printables Giveaway! We’re celebrating the one year anniversary of Coupons with Q Etsy shop being in business! Enjoy a Buy 1 Get 1 Free sale for the entire month of January! We”re having a new giveaway every week of coupon printables to keep you organized and saving money in the new year! Make sure to stop back every week to get your entries in! Everyone has multiple chances to win, plus each giveaway will have multiple winners! To take advantage of the B1G1 sale, purchase a printable through the Etsy shop. In the comments section of your transaction, please state which free printable you would like to receive. Your free printable must be of equal or lesser value. The coupon and family binders are not eligible. Week Three will have THREE winners. Each prize package is worth $40. Your printables will arrive to you in PDF format via email. The entry form will be open from 12am EST January 20, 2013 until 1159pm EST January 26, 2013. Special thanks to… Color Me Crystal, Coupon Queen that Saves the Green, The Mommy Island, Living at the Whitehead’s Zoo, Pixie Dusted Homeschool, Pittsburgh Frugal Mom, Enchanted Savings, Family, Love and Other Stuff. Frugal Fanatic, Mommy Needs Her Coffee, Two Girl$ and $ome Coupon$, Giveaway Bandit, and Krazy Coupon Club … for making this giveaway a success! My goal for 2013 is to build my emergency savings fund back up. We’re looking forward to our long awaited trip to China in October! I’m looking forward to slowing down and taking more time for myself without feeling guilty. I’d like to lose 5 pounds in 2013. I am trying to learn a second language. I want to save more money and be healthier! I have a goal of making 2013 a GREAT year, no matter what. We have had three deaths all within a week of each other. All Aunties to my husband and I. So I guess we aren’t starting out the year in such a good manner. But I AM determined to get back up and try to make my goal in spite of it all! To my parents visiting…..I have not seen them in over a year. To spend more time with my kids.